Scott Clifthorne has education in his blood. 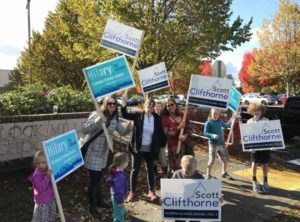 As the proud son of a paraprofessional who has served for 32 years in the Highline School District, Scott grew up valuing public education and those who dedicate their professional lives to it. Scott and his wife, Sarah, are both actively involved in their three children’s schools. Scott has been the PTA President at Lincoln Elementary School, and Sarah is the PTA Treasurer at Marshall Middle School. Serving in a volunteer capacity was always in the plan; however running for the Olympia School Board was not Scott’s original intent. “About three years ago, the district adopted a new English Language curriculum,” he explains. “The curriculum that was originally chosen did not fit the needs of all classrooms in the district and I became involved to make sure that the chosen curriculum made sense.” Ultimately a compromise was made and two options were made available to meet the varying needs of the schools. The seed was planted and Scott began thinking about running for the school board and having a seat at the table when decisions are made. Scott was a natural choice for the school board and garnered the most votes in both the primary and the general election. Almost over-qualified for the job, he has broad experience that will serve him well on the board. He was an International Baccalaureate student at Mt. Rainier High School in Des Moines and received his Bachelor’s degree at the University of Puget Sound. While studying for his Masters Degree in Political Science from the University of California, Scott was asked to be a student steward for the teachers’ union which was negotiating a new contract at the time. Scott went on to start his own consulting firm negotiating employment contracts for entities such as the City of Black Diamond and the Teamsters 117. His experience with and support of public sector organizations lends itself well to supporting the causes of teachers, staff and students. Scott is especially passionate about creating equity strategies within the district. The Olympia School District has one of the highest graduation rates in the state, and he says that we can be proud of our success, but we need to do the work to make sure that all students have equal opportunities. “We should not be able to look at race or socioeconomic status and predict graduation rates based on these factors,” explains Scott. His goal is to ensure a pathway to success for all students. One of these paths is to destigmatize the trades. “Our K-12 education in Olympia is engineered almost solely around college preparedness,” explains Scott. “We need to help students whose paths include jobs in trades like carpentry and electrician apprenticeships.” The carpentry profession is projected to grow by six per cent from 2014 to 2024, according to the Bureau of Labor Statistics. The housing market is expanding and carpenters are needed for the surge in new-home construction projects. Scott aims to help those students who have interests outside of college prep find their niche. There are big challenges ahead as new state budgets and changes to school funding loom. Scott would like to see staff, and paraeducators in particular, receive the support they deserve. 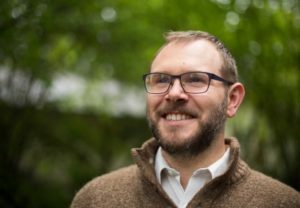 His vast experience negotiating contracts in the public sector for organizations like the Humane Society of Pierce County give him a unique perspective. Scott and Sarah do not spend all their time thinking about the Olympia School District. They find time to enjoy watching their kids breaking boards at the US Martial Arts Center where they take taekwondo lessons and enjoying the outdoors in our beautiful Pacific Northwest. Sarah serves on the board of SafePlace and works as staff in the state Senate. For more information, visit the Olympia School District website.